Your Words...Your Poem...Your Chance to express what's in your heart. 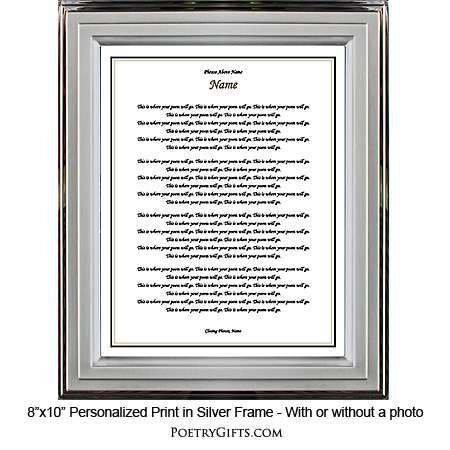 If you love to write poetry or have a desire to pen your thoughts and feelings about someone you care about or an occasion that has moved you, we will design your words or verse into a Poetry Gift that is suitable for framing in any standard 8" x 10" picture frame. 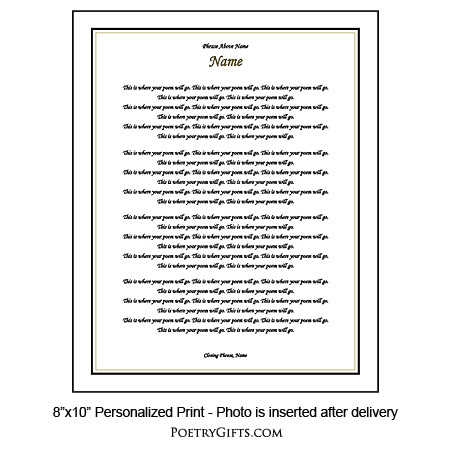 We can personalize your poem with names, an optional date, and a closing message. You can also request a cut-out opening for a photo so you can add a favorite picture. Give a special and meaningful gift...give your words...a gift from your heart! If you need a Thoughtful, Meaningful, and Lasting gift of poetry for someone you care about, let us design your poetry on specialty cardstock and personalize it for you with names, an optional special occasion date, and a closing message. There are so many occasions where poetry would be the perfect gift to give: on a son or daughter's wedding day, for a wife or husband on an anniversary, for parent's anniversary, for a friend's birthday, a child's graduation, as a thank you gift and even as a sympathy gift for someone dealing with the loss of a loved one, etc. You can also write an inspirational poem or verse to inspire someone close to you. When you add names and dates to your Poetry Gift it will become a treasured keepsake that your loved one can enjoy reading over and over again. In other words "It's a Gift that Keeps on Giving!" 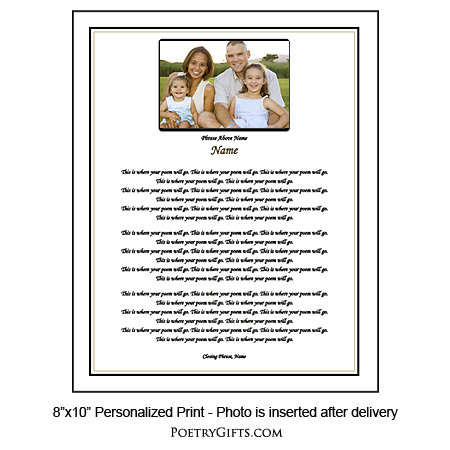 Even better, personalize the poem even more by ordering it with an opening for a favorite photo. 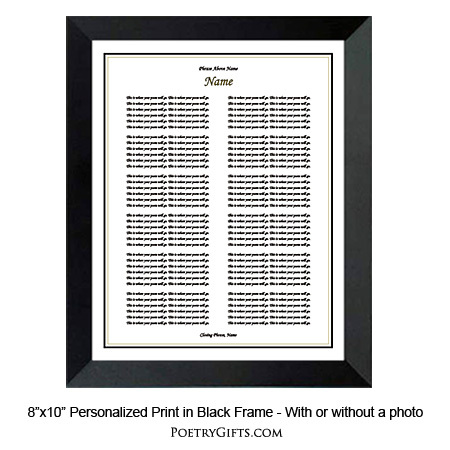 If you would like to frame a poem, choose from our modern black wooden frame or contemporary silver metallic frame. 3. Closing Phrase and Your Name(s) (as seen after poem) - (Examples: With My Deepest Sympathy, David; All My Love, Alicia; With Love, Mom & Dad; etc." 7. Please type in your poem (do not use all upper case lettering) - This is where you will type in the poem, verse or sincere thoughts you have written. A Poetry Gifts designer will take the lines of type and design it into the Poetry Gift above making sure that it looks its best. Please look at the above design in order to determine a suitable poem length. This is a good design to use if you have a long poem. There are no set guidelines; but the longer your poem the smaller the type. If your poem is much longer than the length you see in the photos above, the font/type will need to be made smaller to accommodate your entire poem. On the order form, please make sure to type an email address that you check often and phone number in case the designer needs to reach you with any questions. Unless you have permission from the author or poet, please only submit non-copyrighted works. 5 out of 5, Based on 6 Reviews. I am extremely happy with the way my framed poem turned out. Would not hesitate in doing this again. Thank you so much! I am really happy with the way my poem turned out. This is exactly what I was looking for. Really nicely done. I just bought the print and bought my own frame to put this in. Everything turned out perfect. Very nicely done. Quality frame . Extremely happy with finished product! Wanted something that would highlight my poem and this was perfect. LOVED the finished product. It was very good quality and very tastefully done. Also, my original purchase was lost in the mail and a they quickly shipped a new one at a faster rate of shipping so I would get it in time. I really appreciated not only the quality of the product but the kindness and helpfulness of the business. Thank you so much! I will definitely be ordering from here again! Just got my order and I can't wait to give it my friend. He will will go bonkers! Thanks!